Upcoming Speakers Peter Locke suggested we approach businesses we would like to see in our neighborhood to speak at a membership meeting. We could ask questions as to what it would take to bring them to the neighborhood, perhaps a second location of their business. Eckhart Park is having Shakespeare in the Park. A coordinator will come speak at the July membership meeting. A Bus Rapid Transit representative will hopefully speak at the July membership meeting about the Ashland BRT plans. Neal McKnight will follow up. Since the Commercial Park block party was cancelled due to weather, the suggestion was made to team up and schedule our block party to coincide with the rescheduled Commercial Park party and have one larger party. Peter Locke will coordinate, more info to come. Signage A group is going to the Logan Square alderman to stop the proliferation of billboards, including LED signage in their neighborhood. As EVA has the same concerns, we would like to write a letter of support. EVA would like to make improvements on Augusta such as tree pits and a bike lane. We need to get in touch with the county commissioner about this, as Augusta is a county road. In the past, members purchased a yearly membership ($30 Business, $20 Family, $15 Individual and $5 Senior), but EVA would now like to provide annual memberships for a donation. We will have drives to raise money for specific purposes throughout the year to draw new members. Along with a membership comes the ability to vote on issues at the membership meetings. 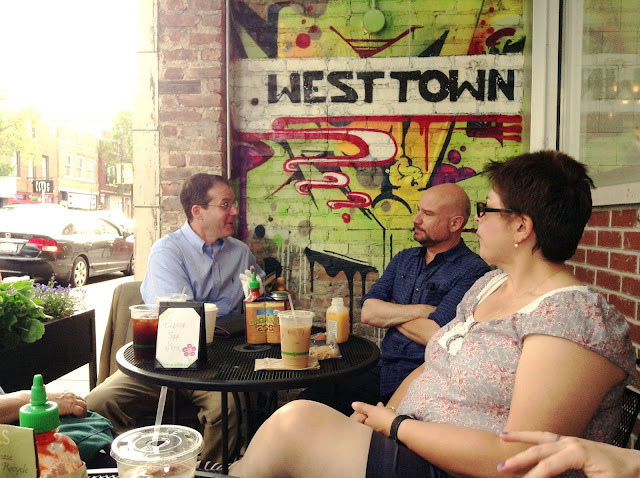 Meeting commenced at 6:44pm, adjourned at 7:34pm at West Town Bakery, 1930 W. Chicago Ave. Board Members – Neal McKnight, Peter Locke, KK Goh, Meghan Quinn, Gladys Anselmo, Stephen Rynkiewicz/ Other attendees – Marjie Issacson, Rich Anselmo.